The welfare state faces various challenges in Scandinavia and many European countries today, including a poor work environment in the public sector, a growing democracy deficit, and demographic obstacles. In this new book, Victor A. Pestoff argues that the state cannot resolve these challenges alone or together with the market, rather it requires the active participation of citizens and the third sector in order to overcome them and become more sustainable and flexible in the future. This book addresses the need for a more democratic architecture for the European welfare state, opening new perspectives for developing alternative channels for direct citizen participation at the sub-municipal level of governance. 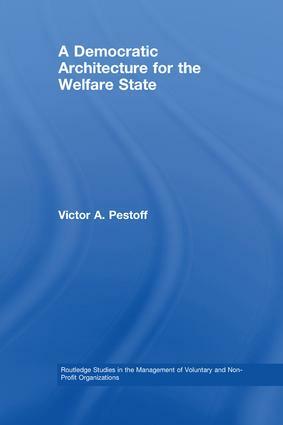 Pestoff finds that neither democratic theory nor welfare state theory devotes adequate attention to the contemporary role of the third sector as a service provider or to greater direct citizen participation in the provision of welfare services. He shifts the focus of analysis from the input to the output side of the political system and explores new ways to promote a greater role for the third sector and more citizen participation in the provision of universal, tax financed welfare services. Part 1 discusses social economy actors in Sweden and Scandinavia, both from a historical and future perspective. Part 2 explores major issues for the third sector and welfare state, including the allocation of an organization’s surplus or profit, work environment and service quality in public services and the third sector, consumer perspectives on the social economy, democratizing medical and health care in Japan, and co-production of childcare services in eight European countries. Part 3 revisits the third sector and state in democratic theory and welfare theory, as well as recognizing major hurdles to the third sector and democratization of the welfare state. Part 4 concludes by summarizing the politics of participation in the welfare state.